Shapeabilities Live Love Laugh Etched Dies On the Wings of Love Collection by Joanne Fink is a set of three dies includes the words: Live, Love and Laugh. Words to live by and to use in your projects. On the Wings of Love Collection brings together faith and art for a great creative collaboration by Joanne Fink. Approximate Size: Live: 2.05 x 1.25 in. 5.20 x 3.20 cm, Love: 2.10 x 1.35 in. 5.30 x 3.40 cm, Laugh: 2.35 x 1.55 in. 6.00 x 4.00 cm. Shapeabilities Love Dream Create Etched Dies On the Wings of Love Collection by Joanne Fink is a set of two intricate border dies. Both contemporary style motifs to add some fun to your projects. On the Wings of Love Collection brings together faith and art for a great creative collaboration by Joanne Fink. Approximate Size: Love: 2.20 x 5.65 in. 5.60 x 14.40 cm, Blocks: 1.80 x 6.00 in. 4.60 x 15.20 cm. Shapeabilities Love Frame Etched Dies On the Wings of Love Collection by Joanne Fink is a set of two dies includes a solid heart shape and a coordinating heart insert design with words surrounding the edge. On the Wings of Love Collection brings together faith and art for a great creative collaboration by Joanne Fink. Approximate Size: Outer: 3.80 x 5.25 in. 9.70 x 13.30 cm, Pattern: 3.65 x 4.35 in. 9.30 x 11.00 cm. Shapeabilities Lovely Lilac Etched Dies Good Vibes Only Collection by Stephanie Low is a set of two dies which includes one flower silhouette shape and one intricate floral design. An admirer of all things nature and organic in shapes and elements, Stephanie Low was inspired to create Good Vibes Only Collection. It also complements her Cool Vibes Collection to bring your projects to the next level. Approximate Size: Wildflower: 3.00 x 3.00 in. 7.60 x 7.60 cm, Backer: 3.25 x 3.20 in. 8.30 x 8.10 cm. Shapeabilities Lunette Arched Borders Etched Dies Chantilly Paper Lace Collection by Becca Feeken is a set of six dies includes four different border insert designs with a top and bottom arch. Add your choice of insert design with either the top or bottom arch to cut a decorated edge. Or just use the insert die to make an inset pattern in your project. Chantilly Paper Lace Collection by Becca Feeken is a beautiful lace design known for its outlined patterns and ornate details. Bring some of this French style to your projects. Spellbinders Shapeabilities cut, deboss, emboss and stencil with a single etched die template. Approximate Size: Inserts (4): 5.15 x 1.85 in. 13.10 x 4.70 cm, Bottom Arch Cut: 5.35 x 1.30 in. 13.60 x 3.30 cm, Top Arch Cut: 5.35 x 2.10 in. 13.60 x 5.30 cm. Shapeabilities Mosaic Vine Etched Dies Thoughtful Expressions by Marisa Job is a set of two dies includes vines and leaves in intricately cut designs. Would make wonderful accents with flower shapes. Thoughtful Expression Collection by Marisa Job brings heartfelt greetings and designs to your projects for a great addition and complement to Marisas other collections. Spellbinders Shapeabilities cut, deboss, emboss and stencil with a single etched die template. Approximate Size: Small Leaf: 0.35 x 0.70 in. 0.80 x 1.80 cm, Medium Leaf: 0.40 x 0.95 in. 1.00 x 2.40 cm, Large Leaf: 0.50 x 1.20 in. 1.30 x 3.00 cm, Mosaic Vine: 3.10 x 4.31 in. 7.80 x 11.00 cm. Shapeabilities Note Holder Etched Dies Timeless Heart Collection by Marisa Job is a set of six dies that has all the parts in making a note holder, include floral accents. Perfect for a "thinking of you" gift like a teacher or small party favors - many ideas come to mind. Assembed Size: 3.125 x 3.25 x 0.50 in. Licensed Designer Marisa Job brings sweet floral and heart motifs together to create this Timeless Heart Collection to help add beautiful elements into projects. Spellbinders Shapeabilities cut, deboss, emboss and stencil with a single etched die template. Approximate Size: Border: 4.25 x 0.75 in. 10.80 x 1.90 cm, Arch Outline: 3.75 x 4.60 in. 9.50 x 11.70 cm, Arch Inlay Design: 3.50 x 4.35 in. 8.90 x 11.00 cm, Interior Arch Design: 2.45 x 3.35 in. 6.20 x 8.50 cm. Shapeabilities Petal'd Poetry Etched Dies Good Vibes Only Collection by Stephanie Low is a set of four dies which includes two flower silhouette shapes and two intricate floral designs. An admirer of all things nature and organic in shapes and elements, Stephanie Low was inspired to create Good Vibes Only Collection. It also complements her Cool Vibes Collection to bring your projects to the next level. Approximate Size: Big Flower: 2.05 x 2.00 in. 5.20 x 5.10 cm, Backer: 2.20 x 2.20 in. 5.60 x 5.60 cm, Small Flower: 1.05 x 1.00 in. 2.70 x 2.50 cm, Backer: 1.20 x 1.20 in. 3.00 x 3.00 cm. Shapeabilities Rolled Flowers Etched Dies Timeless Heart Collection by Marisa Job is a set of three dies in three different sizes. Just ink the paper to desired colors and then just roll! From stamen to petals to leaves, you created a whole flower with one roll - SO CLEVER! Licensed Designer Marisa Job brings sweet floral and heart motifs together to create this Timeless Heart Collection to help add beautiful elements into projects. Spellbinders Shapeabilities cut, deboss, emboss and stencil with a single etched die template. Approximate Size: Small Flower: 5.00 x 0.75 in. 12.70 x 1.90 cm, Medium Flower: 6.00 x 0.90 in. 15.20 x 2.30 cm, Large Flower: 7.00 x 1.05 in. 17.80 x 2.70 cm. A beautiful butterfly is the center piece of this design. Three sets of accents can be layered or used alone. Spellbinders Shapeabilities Strips cut, emboss and stencil with a single die template. Approximate Die Template Sizes: Hearts: ranges 1/4 to 3/8" (3), Flowers: ranges 1/4 to 3/8" (3), Butterflies: ranges 1/4 to 3/8" (3), Strip: 6 x 1 7/8". Shapeabilities Sew Sweet Sentiments Sew Sweet Collection by Tammy Tutterow is a set of seven dies including five word dies with two heart designs. Inspired by Tammy's love of sewing, stitchery and all things handmade, her Sew Sweet Collection takes your projects from paper to fabrics and beyond, expanding possibilities in creating heartfelt projects. Approximate Size: Scalloped Heart: 1.19 x 1.51 in. 3.10 x 3.90 cm, Heart: 1.00 x 1.36 in. 2.60 x 3.50 cm, Sweet: 0.70 x 1.80 in. 1.80 x 4.60 cm, With: 1.50 x 1.00 in. 3.90 x 2.50 cm, Love: 1.82 x 2.11 in. 8.80 x 11.40 cm, My: 1.25 x 0.89 in. 3.20 x 2.30 cm, Heart (sentiment): 2.72 x 1.24 in. 6.80 x 3.20 cm. Shapeabilities Sew Sweet Trims Sew Sweet Collection by Tammy Tutterow is a set of eight dies including a variety of 6 in. trim edge designs to complement any project from borders, layering borders to decorative strips. Inspired by Tammy's love of sewing, stitchery and all things handmade, her Sew Sweet Collection takes your projects from paper to fabrics and beyond, expanding possibilities in creating heartfelt projects. Approximate Size: Lace with Circle: 6.00 x 0.72 in. 15.30 x 1.90 cm, Lace with Drops: 6.00 x 0.71 in. 15.30 x 1.80 cm, ZigZag Strip: 6.00 x 0.58 in. 15.30 x 1.50 cm, Flow Strip: 6.00 x 0.45 in. 15.30 x 1.20 cm, Lace Strip: 6.00 x 0.84 in. 15.30 x 2.20 cm, Pointy Strip: 6.00 x 0.39 in. 15.30 x 1.00 cm, Flat Strip: 6.00 x 0.38 in. 15.30 x 1.00 cm, Roundy Strip: 6.00 x 0.36 in. 15.30 x 0.90 cm. Shapeabilities Side Floral Panel Etched Dies has intricate cuts full of swirly vines and heart-shaped petal blooms with a diagonal format. Blooming Garden Collection by Marisa Job brings sweet floral designs in many forms from accents to boxes to frames. Perfect for special occasions such as weddings, showers or as a lovely gift. Approximate Size: 2.70 x 5.25 in 6.90 x 13.30 cm. Shapeabilities Sweet Tweets Sew Sweet Collection by Tammy Tutterow is a set of 21 dies including birds and a birdhouse. Perfect for a 6 x 6 in. card design. Inspired by Tammy's love of sewing, stitchery and all things handmade, her Sew Sweet Collection takes your projects from paper to fabrics and beyond, expanding possibilities in creating heartfelt projects. Shapeabilities Sweetheart Swirl Etched Dies Romancing the Swirl Becca Feeken is a set of four dies that includes a frame outline and its beautiful designed frame with an inner oval insert. An intricate design accent piece is also in the set. Romancing the Swirl Collection by Becca Feeken is full of curl and swirl motifs that connect them to elements worthy of decoration and card making. This collection is a welcome addition to and matches well with her other collections in the Amazing Paper Grace line. Approximate Size: Frame Outline: 4.55 x 5.95 in 11.60 x 15.10 cm, Frame Pattern: 4.35 x 5.75 in 11.00 x 15.60 cm, Oval Insert: 2.05 x 3.20 in 5.20 x 8.10 cm, Swirl Accent: 1.70 x 1.70 in 4.30 x 4.30 cm. Shapeabilities Swirl Frame Etched Dies On the Wings of Love Collection by Joanne Fink is a set of two dies includes a whimsical swirly frame and flower accent. On the Wings of Love Collection brings together faith and art for a great creative collaboration by Joanne Fink. Approximate Size: Frame: 4.25 x 5.50 in. 10.80 x 14.00 cm, Flower: 1.45 x 3.30 in. 3.70 x 8.40 cm. Shapeabilities Hexagon Petal Box Etched Dies is a set of eight dies to create a sweet box eight-sided box with petal edges, includes decorative accents to decorate the box. Blooming Garden Collection by Marisa Job brings sweet floral designs in many forms from accents to boxes to frames. Perfect for special occasions such as weddings, showers or as a lovely gift. Assembled Size: 3.5" x 2.75" x 1.75". Shapeabilities Swirl Leaf Branch Etched Dies brings a beautiful swirly leaf accent to any project and is a perfect companion piece for any of Marisa Job flower die sets. Blooming Garden Collection by Marisa Job brings sweet floral designs in many forms from accents to boxes to frames. Perfect for special occasions such as weddings, showers or as a lovely gift. Approximate Size: 1.80 x 4.25 in 4.50 x 10.80 cm. Shapeabilities Swirl Tags Etched Dies Romancing the Swirl Becca Feeken is a set of nine dies that includes two tag shapes with inserts, four accent designs and a circle to punch out a tag opening. Romancing the Swirl Collection by Becca Feeken is full of curl and swirl motifs that connect them to elements worthy of decoration and card making. This collection is a welcome addition to and matches well with her other collections in the Amazing Paper Grace line. Approximate Size: Arch Tag 1: 2.00 x 3.16 in 5.10 x 8.09 cm, Arch Tag 2: 1.74 x 2.90 in 4.40 x 7.40 cm, Scallop Tag 1: 2.10 x 3.16 in 5.30 x 8.00 cm, Scallop Tag 2: 1.84 x 2.90 in 4.40 x 7.40 cm, Loop Swirl: 0.95 x 1.78 in 2.40 x 4.50 cm, Heart Swirl: 0.77 x 1.84 in 2.00 x 4.70 cm, Scroll Swirl: 1.03 x 1.81 in 2.60 x 4.60 cm, Fleur Swirl: 1.18 x 1.34 in 3.00 x 3.40 cm, Tag Hole: 0.25 x 0.25 in 0.60 x 0.60 cm. Shapeabilities Tea Light Flower Etched Dies Thoughtful Expressions by Marisa Job is a set of one die. Simply fold in half at the score line and wrap around the tea light. The petals are off set at fold to give you a fuller look. Just that simple! Thoughtful Expression Collection by Marisa Job brings heartfelt greetings and designs to your projects for a great addition and complement to Marisas other collections. Spellbinders Shapeabilities cut, deboss, emboss and stencil with a single etched die template. Approximate Size: Tea Light Flower: 5.10 x 3.70 in. 12.90 x 9.40 cm. Shapeabilities Tea Pots Etched Dies Cuppa Coffee, Cuppa Tea Collection by Sharyn Sowell is a set of four dies that includes four different intricate tea pot designs. For a Coffee Pot option, we offer S4-955 Coffee Brewing Etched Dies Set. Approximate size: Daisy Tea Pot: 2.20 x 2.00 in. 5.60 x 5.10 cm, Striped Tea Pot: 2.35 x 1.75 in. 6.00 x 4.40 cm, Rose Tea Pot: 2.50 x 2.00 in. 6.40 x 5.10 cm, Peony Tea Pot: 2.65 x 2.10 in. 6.70 x 5.30 cm. Shapeabilities Textured Flowers Etched Dies Timeless Heart Collection by Marisa Job is a set of seven dies with realistic details on the petals and leaves that make you look twice! The more you layer, the fuller the blossom. Another great addition to your flower die collection. Licensed Designer Marisa Job brings sweet floral and heart motifs together to create this Timeless Heart Collection to help add beautiful elements into projects. Spellbinders Shapeabilities cut, deboss, emboss and stencil with a single etched die template. Approximate Size: Extra Small Flower: 1.00 x 1.00 in. 2.50 x 2.50 cm, Small Leaf Set: 1.40 x 0.90 in. 3.60 x 2.30 cm, Small Flower: 1.43 x 1.40 in. 3.60 x 3.60 cm, Large Leaf Set: 1.80 x 1.80 in. 4.60 x 4.60 cm, Medium Flower: 1.85 x 1.80 in. 4.70 x 4.60 cm, Large Flower: 2.00 x 2.00 in. 5.10 x 5.10 cm, Extra Large Flower: 2.30 x 2.20 in. 5.80 x 5.60 cm. Shapeabilities Tiara Rondelle Etched Dies Elegant 3D Vignettes Collection by Becca Feeken is a set of two dies includes a beautiful rondelle circle die with two intricate designs corners. Works with S6-136 Shapeabilities Grand Dome 3D Card Etched Dies. Elegant 3D Vignettes Collection by Becca Feeken brings her romantic elegance style to the next level in a three dimensional format. Most of this collection purposively makes a dimensional creation or offers elements to enhance a dimensional piece for a mix or match option. Approximate Size: Rondelle: 3.65 x 5.80 in. 9.20 x 14.70 cm, Corner (2): 1.85 x 1.85 in. 4.70 x 4.70 cm. Shapeabilities Top Floral Panel Etched Dies is intricate design full of swirly vines and heart-shaped petal blooms to dress up your card front. Blooming Garden Collection by Marisa Job brings sweet floral designs in many forms from accents to boxes to frames. Perfect for special occasions such as weddings, showers or as a lovely gift. Approximate Size: 5.10 x 2.40 in 12.90 x 6.00 cm. Shapeabilities Trefoil Crest Etched Dies Romancing the Swirl Becca Feeken is a set of two dies that includes a beautiful trefoil crest design in two different sizes. Perfect elegant and classic accents for any of your projects. Romancing the Swirl Collection by Becca Feeken is full of curl and swirl motifs that connect them to elements worthy of decoration and card making. This collection is a welcome addition to and matches well with her other collections in the Amazing Paper Grace line. Approximate Size: Large Trefoil: 4.35 x 4.00 in 11.00 x 10.20 cm, Small Trefoil: 2.35 x 1.50 in 6.00 x 3.80 cm. A row of three oval shapes with ornate designs with emboss and deboss details. What a stunning accent to your projects! Spellbinders Shapeabilities Decorative Strips cut, emboss and stencil with a single die template. Approximate Die Template Sizes: Inset: 5 5/8 x 2 1/4", Border: 5 3/4 x 2 3/8". Shapeabilities Vintage Pierced Banners Etched Dies Chantilly Paper Lace Collection by Becca Feeken is a set of three dies includes three different styles of banner with dotted details to the edge. A great addition to your etched die collection. Chantilly Paper Lace Collection by Becca Feeken is a beautiful lace design known for its outlined patterns and ornate details. Bring some of this French style to your projects. Spellbinders Shapeabilities cut, deboss, emboss and stencil with a single etched die template. Approximate Size: Straight Small Tails(2): 0.80 x 0.50 in. 2.00 x 1.30 cm, Straight Pierced Tails (2): 1.15 x 0.75 in. 2.9 x 1.9 cm, Curved Tails(2): 1.30 x 0.75 in. 3.30 x 1.90 cm, Straight Banner: 3.00 x 0.90 in. 7.60 x 2.30 cm, Oval Banner: 3.00 x 1.40 in. 7.60 x 3.60 cm, Curved Banner: 3.50 x 1.30 in. 8.90 x 3.30 cm. Shapeabilities Wine Snippets Etched Dies Wine Country by Stacey Caron is a set of five dies includes snippets of wine-related designs in various square shaped motifs. Wine Country Collection by Stacey Caron will make your projects the toast of any wine tasting, parties or gifts with coordinating motifs to create accents to charms to tags...such great fun! Approximate Size: Wine Bottle and Glass Snippet: 3.00 x 3.00 in 7.60 x 7.60 cm, Grapes Snippet: 2.00 x 2.00 in 5.10 x 5.10 cm, Corkscrew Snippet: 2.00 x 2.00 in 5.10 x 5.10 cm, Grape Leaf Snippet: 1.00 x 1.00 in 2.50 x 2.50 cm, Wine Glass Snippet: 1.00 x 1.00 in 2.50 x 2.50 cm. Spellbinders takes adorable to the next level with our new Woodland Collection. Let your imagination wander through a whimsical world with our new Woodland inspired shapes. Create a cute Woodland wreath that can be used in so many creative ways. Perfect for Cards, Gifts, Parties, Scrapbook Pages, and More! Approximate Size: Wreath 1: 4.15 x 5.30 inches, Wreath 2: 3.15 x 3.25 inches, Flowers with Stems: 0.70 x 1.25 inches, Flowers: 0.40 x 0.50 inches, Stem with Leaves: 0.50 x 1.80 inches. Spellbinders Shapeabilities cut, emboss and stencil with a single die template. Approximate Size: Leaf: 1/2 x 3/4" (2 pcs), Acorn: 5/8 x 3/4", Leaf Accent: 2 1/4 x 1 3/8", Acorn Accent: 3 1/2 x 1 1/8", Banner: 3 1/2 x 7/8", Corner: 2 3/4 x 3 1/8". As a singular shape, the Border Die creates a shaped silhouette. When it is nested with the Inset Die, it makes a beautiful embellishment. Used alone, the Inset Die creates a wonderful embedded pattern. The Pocket Die Template has score lines on three of its sides to fold under to create a 4 3/8 x 2 1/4" pocket. Designed by Becca Feeken. Spellbinders Shapeabilities cut, emboss and stencil with a single die template. Approximate Die Template Sizes: Accent Inset: 1 1/2 x 1 3/8", Accent Border: 1 3/4 x 1 3/4", Pocket: 5 1/4 x 2 5/8". Flowers are a Donna Salazar signature! These Bitty Blossoms cut, emboss, stencil and then roll into the most adorable mini flowers for cards, scrapbook pages and more! This set has 3 sizes of spiral flowers, each with wide, toothed petals and coordinating leaves to make a bouquet of fun. Spellbinders Shapeabilities dies cut, emboss and stencil with a single die template. Approximate Die Template Sizes: Single Leaf SM: 1 1/4" x 5/8", Single Leaf LG: 1 3/8" x 3/4", Double Leaves: 2 1/8" x 7/8", Flower SM: 2" x 1 3/4", Flower Med: 2 1/4" x 2 1/8", Flower LG: 3 1/4" x 3". Shapeabilities Boxed In Etched Dies The Perfect Match by Debi Adams is a set of three die to create a box, just cut two each of the Box Half and Box Flap to assemble. Assembled box measures 2 inch wide x 3.375 inch height x 0.50 inch depth. Shapeabilities Chinese Knot Frame Etched Dies Destination China by Lene Lok is a set of two dies that includes large intricate design square frame with knot inspired corners and an octagon-shaped frame that can be used together or on its own. Approximate size: 1st layer: 4.15 x 4.15 in. 10.50 x 10.50 cm, 2nd layer: 2.30 x 2.30 in. 5.80 x 5.80 cm. Shapeabilities Chinese Traditional Fence Etched Dies Destination China by Lene Lok is a set of three dies that includes a rectangular outline large enough to next two inserts, and two different insert designs. Approximate size: Frame: 5.10 x 4.75 in. 12.80 x 12.50 cm, Insert: 2.40 x 4.60 in. 6.50 x 11.60 cm. This Shapeabilities Classic Tiled Spheres Etched Die set comes with two dies that bring contemporary or ornate design option to your projects. Spellbinders Shapeabilities cut, emboss and stencil with a single die template. Approximate Size: Endless Circles: 3.00 x 3.00 in., Circle Knots: 3.00 x 3.00 in. This Shapeabilities Classic Twirling Vines Etched Die set has intricate cut designs and a beautiful center piece for a stunning accent on any project. Spellbinders Shapeabilities cut, emboss and stencil with a single die template. Approximate Size: 5.50 x 2.20 in. Shapeabilities Jagged Edge Etched Dies by Seth Apter is a corner piece that has sharp, spike-like jagged edges. Use a one or cut them up for accents around your project. Spellbinders Shapeabilities cut, deboss, emboss and stencil with a single etched die template. Collection #4 by Seth Apter is a continued series of his popular unique mixed media style that can recreated through his line of dies, stamps and embossing folders with Spellbinders. Approximate Size: 3.50 x 3.70 in. 8.90 x 9.40 cm. Spellbinders Shapeabilities cut, emboss and stencil with a single die template. Approximate Size: Butterfly 1: 5/8 x 1/2", Butterfly 2: 7/8 x 5/8", Sun: 1", Leaf: 3/8 x 7/8", Two-Leaf 1: 1 1/8 x 3/4", Two-Leaf 2: 1 3/8 x 1", Four-Petal Flower 1: 3/4", Four-Petal Flower 2: 1", Five-Petal Flower 1: 1/2", Five-Petal Flower 2: 3/4", Five-Petal Flower 3: 1 1/8", Six-Petal Flower 1: 1 1/4 x 1 3/8", Six-Petal Flower 2: 1 3/8 x 1 5/8", Eight-Petal Flower 1: 3/4", Eight-Petal Flower 2: 1", Stem 1: 1 7/8 x 2 7/8", Stem 2: 1 3/4 x 3". 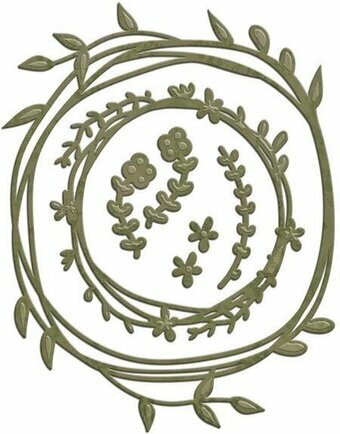 Shapeabilities Rose Buds Etched Dies is a set of three dies that cut two sizes of rose blooms for a total of six, and cuts two sizes of star flowers which also can be used as the flower base or green accents. Perfect for special occasions such as weddings, showers or as a lovely gift. Approximate Size: Small Flower: 0.95 x 0.90 in 2.30 x 2.30 cm, Star Flower Small: 1.00 x 0.95 in 2.50 x 2.30 cm, Star Flower Lg: 1.11 x 1.15 in 2.80 x 2.90 x cm, Large Flower: 1.20 x 1.15 in 3.00 x 2.90 cm. Shapeabilities Strands Etched Dies by Seth Apter is a set of three dies includes a small accent strand, medium intricate strand design and a large ring of strand. Great to layer or use separately in your projects. Spellbinders Shapeabilities cut, deboss, emboss and stencil with a single etched die template. Collection #4 by Seth Apter is a continued series of his popular unique mixed media style that can recreated through his line of dies, stamps and embossing folders with Spellbinders. Approximate Size: Small: 0.90 x 1.00 in. 2.30 x 2.50 cm, Medium: 2.00 x 2.00 in. 5.10 x 5.10 cm, Large: 3.00 x 2.90 in. 7.60 x 7.40 cm. This Shapeabilities Swirls Strip Etched Die has two rows of delicate swirl designs that create an elegant border accent. Spellbinders Shapeabilities cut, emboss and stencil with a single die template. Approximate Size: 6.75 x 1.60 in. Shapeabilities Swirly Doily Etched Dies Exquisite Splendor by Marisa Job is an open swirly delicate doily design. Shapeabilities Swirl Happy Birthday Frame Etched Dies is a set of three dies includes an intricate birthday sentiment with a beautiful designed frame to nest around it. Approximate Size: Happy Birthday Frame: 3.21 x 2.10 in 8.20 x 10.60 cm, Large Frame: 5.50 x 4.20 in 3.80 x 10.60 cm, Rectangle: 3.60 x 2.37 in 9.50 x 6.00 cm. Shapeabilities Dimensional Floral Panel Card Etched Dies Flower Garden by Sharyn Sowell is a set of five dies includes a beautiful detailed oval frame with bow die, leaves and floral dies to accent. What grows in your garden? Bring wonderful botanical elements into your projects with the Flower Garden Collection by Sharyn Sowell. Spellbinders Shapeabilities cut, deboss, emboss and stencil with a single etched die template. Approximate Size: Frame: 3.65 x 5.00 in. 9.20 x 12.70 cm, Bow: 1.20 x 1.65 in. 3.00 x 4.20 cm, Medium Leaf: 0.50 x 0.75 in. 1.20 x 1.90 cm, Small Flower: 0.61 x 0.70 in. 1.60 x 1.70 cm, Small Leaf: 0.45 x 0.60 in. 1.10 x 1.50 cm, Large Flower: 1.10 x 1.10 in. 2.80 x 2.70 cm. Shapeabilities Floral Bouquet Etched Dies Folk Art Collection by Lene Lok comes as a single die with flower motifs that fan out to create a beautiful accent piece. Folk Art Collection by Lene Lok is inspired by Norwegian folk art with its flower designs featuring scrollwork and flowing lines to create flowing patterns. Bring these whimsical elements into your next projects. Approximate Size: Bouquet: 2.60 x 4.40 in. 6.60 x 11.20 cm. Shapeabilities Floral Mandala Etched Dies Folk Art Collection by Lene Lok comes as a single die with detailed floral motifs in a circular design. Folk Art Collection by Lene Lok is inspired by Norwegian folk art with its flower designs featuring scrollwork and flowing lines to create flowing patterns. Bring these whimsical elements into your next projects. Approximate Size: Mandala: 4.00 x 4.50 in. 10.20 x 11.40 cm. Express your thoughts and greeting with this three piece set of words, use together or separately to make it your own. Choose the colors and materials to fit your project needs. Spellbinders Shapeabilities cut, emboss and stencil with a single die template. Approximate Die Template Sizes: Thank: 1 5/8" x 1/2", You: 1" x 5/8", Hello: 1 1/4" x 1/2", Friend: 1 1/2" x 1/2", With: 1 3/8" x 1/2", Love: 1 1/8" x 1/2". Spellbinders Shapeabilities cut, emboss and stencil with a single die template. Approximate Die Template Sizes: Feather: 3/8" x 7/8" (2 pieces), Dream Catcher: 2 1/2" x 3 1/2". Shapeabilities Kurbits 2 Etched Dies Folk Art Collection by Lene Lok comes with one Kurbits design. If you are looking more narrow Kurbits motif, we offer S3-330 Kurbits set. Folk Art Collection by Lene Lok is inspired by Norwegian folk art with its flower designs featuring scrollwork and flowing lines to create flowing patterns. Bring these whimsical elements into your next projects. Approximate Size: Kurbit: 3.10 x 3.70 in. 7.90 x 9.40 cm.